Hi Andreas! Thanks for the compliment. Before I answer your question, I’d like to stress that I’m a huge fan of Norway’s strength & conditioning practices and their commitment to sports science. In fact, I’m probably more impressed with Norway’s efforts to understand the practical aspects of sports science than I am with any other country right now. I have no doubt that this coach in question works with some incredible athletes, and my response should not be misinterpreted as a sign of disrespect but as a way of pushing strength science forward. That being said, this is an awesome topic and one that I’ve spent tons of time considering. 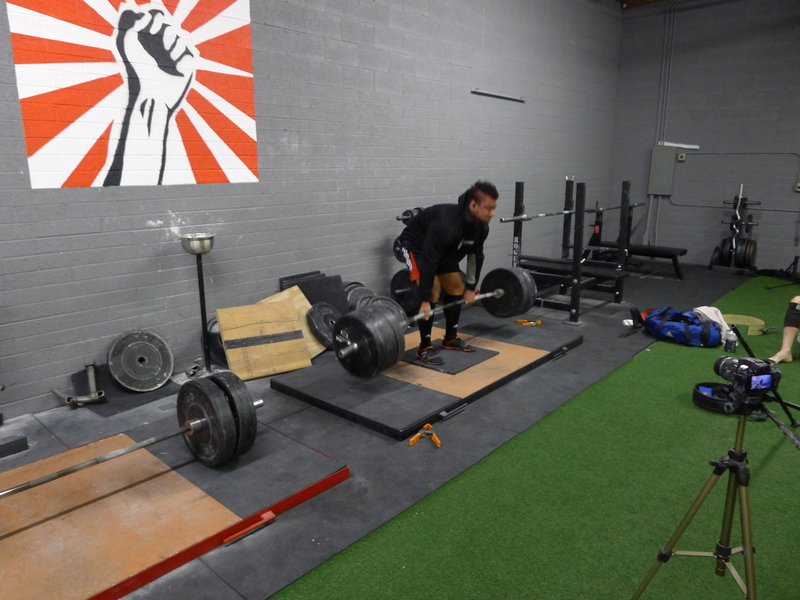 Moreover, at Revolution Training System, I lift with some seriously strong deadlifters. Two are right at the 800 lb level, two at the mid-700 lb level, several guys pulling in the mid 600’s while weighing under 200 lbs, and a handful who can pull triple bodyweight. I think it’s important for fitness writers offering maximal strength advice to actually work alongside strong powerilfters as there’s tremendous knowledge to be gained. Below are my thoughts. And by the way, many of the images used in this blogpost are from Chris Beardsley and my extensive Hip Extension Torque product which can be purchased HERE (read more about it HERE). A maximal pull can last less than 2 seconds for fast lifters and over 10 seconds for slower lifters (HERE is Konstantin with a 6-sec pull, HERE is Belaev with an under 2-sec pull, and HERE is some dude with a 13-sec pull). Therefore, the lifter must be able to hold onto the load for sufficient time to allow for completion. Faster lifters are producing greater force due to acceleration (f=ma) in comparison with slower lifters, and they therefore need slightly stronger grip strength, whereas slower lifters need more grip strength endurance. A stronger grip increases muscle activation throughout the body during the deadlift (or perhaps better put, a weak grip shuts down muscle activation throughout the body during the deadlift). Try pulling close to your 1RM without chalk or with a smoother barbell and you’ll know what I mean – your hip and knee extensors won’t contract forcefully because the body knows that if it pulls with too much acceleration, the grip will give out and you’ll drop the bar. Some lifters indeed miss the lockout due to excessive thoracic flexion. Lifters who are accustomed to pulling with a strict arch will find that it’s much harder to lockout the deadlift with some spinal rounding. When these lifters perform all of their training in a strict fashion and then attempt a maximal pull with a slightly rounded posture, you see them quaking and quivering at the lockout, and most often they miss because they lack the glute strength to push the hips forward. When they pull in a strict fashion, however, the lockout is smooth and easy. The problem is, when going for a maximal attempt (usually seen on a 3rd attempt on the platform), most lifters can’t initiate bar movement off the ground with perfect posture; their legs aren’t strong enough. So they round a bit to get the bar moving, which causes problems for them when they need to lock the weight out. There’s more to the story then meets the eye, so let’s delve deeper. 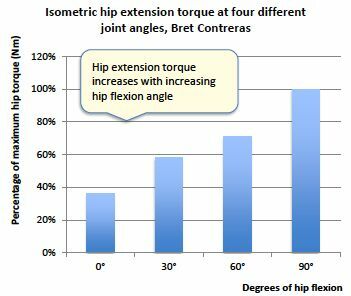 First, let’s examine the hip extension torque angle curve using isokinetic dynamometry. In other words, how strong are the hip extensors (glutes, hamstrings, and adductors) when moving from deep hip flexion to full hip extension? Surprisingly, the hips are markedly stronger in hip flexion. This is likely due to increased contribution of passive forces (stretch) as well as increased adductor contribution to hip extension (adductor moment arms for hip extension are greater in hip flexion). 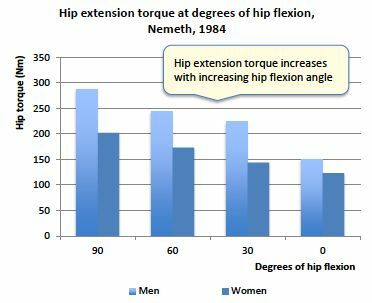 In the graph below, you’ll notice that the hips are almost twice as strong at 90 degrees of hip flexion compared to at 180 degrees of hip flexion (neutral hips). This has been shown to be the case in a number of published studies (six to my knowledge). See HERE for one of the abstracts. 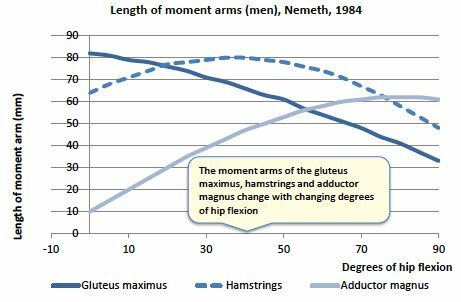 This shows that the adductors have better leverage as hip extensors in hip flexion, whereas the glutes have better leverage as hip extensors in anatomical position. Also, the sum of hip extension moment arms is greater in hip flexion compared to anatomical position. 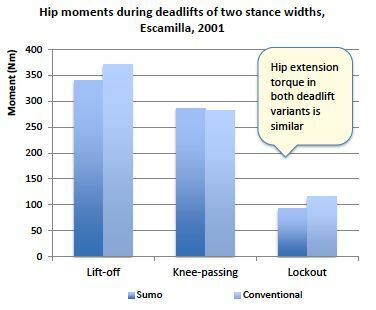 This indicates that hip extensor muscles have better leverage off the floor in a deadlift compared to at lockout. This shows that the hips are stronger in hip flexion compared to in anatomical position. 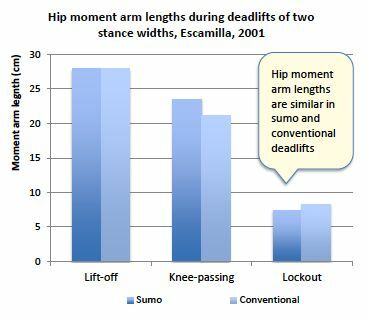 This indicates that hips are stronger off the floor in a deadlift compared to at lockout. This is my isometric hip extension strength at four different ROMs using a Humac Norm (isokinetic dynamometer). Even though I do tons of hip thrusts and back extensions, my hips are over 2.5 times stronger as extensors in hip flexion compared to in anatomical position. This indicates that experienced lifters’ hip extension strength off the floor in a deadlift is markedly superior when compared to lockout position strength. Now let’s examine the hip extension torque requirements in a deadlift. Does the deadlift match the hip’s natural strength curve? As you’ll see in the graph below, it does. This is due to the increasing mechanical advantage in the deadlift as the movement rises, which is due to decreasing resistance moment arms at the top range of motion. See HERE and HERE for abstracts of studies on this topic. The resistance moment arms (not to be confused with muscle moment arms) decrease as the deadlift rises since the hips move closer to the load in terms of horizontal distance from the joint center to the bar. Since the resistance moment arms diminish as the bar rises in a deadlift, it’s no surprise that the hip extension torque requirements diminish as well. Is this mechanical advantage reflected in isometric deadlift strength? In other words, does the vertical ground reaction force we can create near lockout reflect the mechanical advantage (smaller resistance moment arms for the hips and the knees)? Yes, it does. You can see in the graph below that lifters are stronger at the top of the deadlift compared to when pulling off the floor.The table below is from THIS paper, and HERE is a link to a similar experiment conducted at The Glute Lab. Isometric pulling strength is stronger at lockout compared to from the knees or from the floor. This indicates that no lifter should fail at lockout (but they often do). Also, many lifters are stronger in the mid-thigh pull position (which utilizes the quads to a greater degree) compared to the actual deadlift lockout position. I’ve already discussed grip strength and posture above, so below I’ll address the other reasons. If a lifter allows the bar to drift away from the body, it can easily cause a missed lift. The closer the bar is to the body, the lighter the load on the low back. When the bar drifts out in front, the lifter has to reign it back in, and this throws off the lift and prevents the lifter from locking out the load. Ironically, this often happens when the lifter lines up with the bar too close to the shins prior to liftoff. There’s a sweet spot in terms of shin-to-bar distance that is inherent to each lifter that allows for the best mechanics and greatest loading. Sometimes the bar path is fine but the lifter’s kinematics are off. You want to see the body move up and then back (the trunk angle stays fairly similar from lift-off to the knees, and then the trunk straightens out from knees to lockout). You also want consistency from one rep to the next and from one set to the next. Lifters get more consistent over time through practice – beginners show huge variability. Sometimes lifters will allow the shins to jut forward after the bar passes the knees by extending the hips without simultaneously extending the knees, which can cause a missed lockout. This is probably due to the fact that many lifters are stronger in a mid-thigh pull (MTP) compared to a deadlift lockout (see HERE for data on that, and see HERE for what a MTP looks like – but this vid is dynamic, not isometric). This is reversible through training. 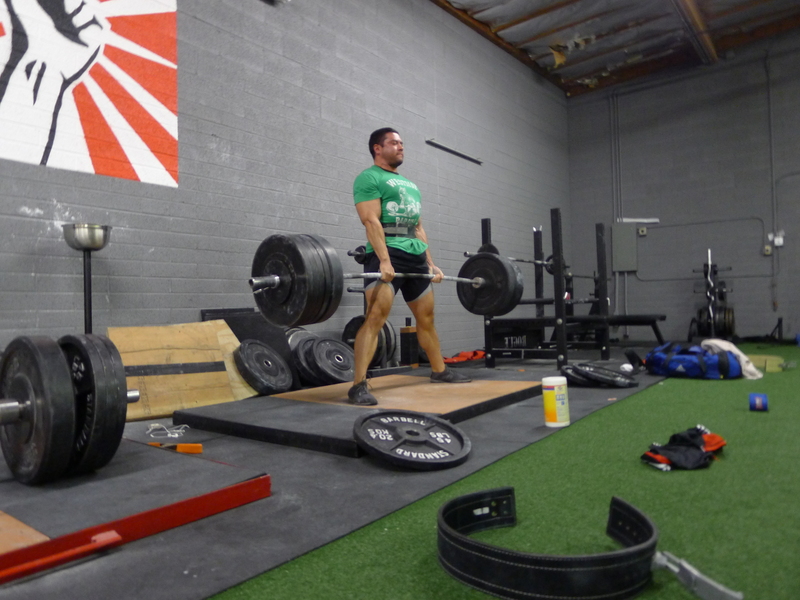 Many people fail to consider the role of fatigue in a maximal deadlift. Some lifters are extremely neurally efficient and can summon very high amounts of neural drive to all the body’s muscles at once. After a couple seconds of pulling with maximal loading, the body is drained and has trouble sustaining maximal contraction. When lifters are accustomed to pulling submaximal loads in training, they can find themselves unable to lockout maximal loads simply because they fatigue by the end of the lift and miss the lockout. Think about it – the lifter possesses the top end strength to finish the lift (if the lifter was to perform a partial deadlift with the same load from the same joint angles, it would be a piece of cake), but he or she is too darn drained to complete it. Some lifters take up to 6 weeks to feel fully recovered from a maximal deadlift and be able to duplicate their strength demonstration, which indicates just how much demand is required of the central nervous system (CNS) during this task. Now let’s discuss end-range hip extension strength. With lifters who either try to mid-thigh pull the weight up (and often end up hitching), or with lifters who find themselves rounded over a bit in the lockout but can’t quite lock the weight out, the problem is often weak end-range hip extension strength and glute strength. It can sometimes be caused by glutes overpowering the hamstrings in hip extension and also the quads failing to stabilize the knee to set the stage for hip extension. At any rate, why can Konstantin lock out his deadlifts even though he rounds? Because his end-range glute strength is phenomenal. He can easily push the hips through. Most lifters cannot do this as they don’t have gigantic glutes like Konstantin. Many lifters do better pulling with an arch so they can lock it out easier. However, if Konstantin pulled with a strict arch, he wouldn’t be able to get as much off the floor as he can when rounded, so his poundages would be lower. It all depends on the lifter. 11. Assistance lifts for different pullers? As you can see, assistance lifts should be tailored to the individual. For the lifter who always pulls with an arch and does best with an arch – just keep squatting, front squatting, deadlifting, and block pulling with strict form. Leg presses and heavy kettlebell swings can help too. But what about the lifter who round-backs the weight up? This lifter has two options. First – work on building strengths – do tons of American deadlifts, hip thrusts and rounded back hip extensions. This will build end-range hip extension and glute strength so that the lifter can continue to lockout maximal pulls. And second, the roundbacker can work on building weaknesses – more squats, front squats, strict deadlifts and block pulls, heavy kettlebell swings with strict form, leg presses, and trap bar deadlifts. These will increase leg strength and arched back hip extension strength that will allow the lifter to pull more weight off the floor, making the lockout easier to achieve. This strategy does not work for everyone though, as anatomy influences the hip extension torque angle curve, and muscular hypertrophy potential in the quads, hams, glutes, and adductors is highly genetic. The lifter who turns the lockout into a mid-thigh pull might benefit from experimenting with RDLs with vertical shins, box squats with vertical shins, back extensions, hip thrusts, and glute ham raises. Sometimes it’s good to alternate approaches – spend a month working on strengths, and then a month working on weaknesses. Other times a lifter might need to dedicate an entire year toward bringing up weaknesses. It all depends. At the end of the day, not everyone will look, feel, or perform the same in the deadlift. I hope you can see here that ideal deadlifting form, along with reasons for failure and optimal assistance lifts, are highly dependent on the lifter. Anatomy determines body segment lengths, muscle moment arms (leverage), muscle size, and spinal shape, which together highly determine deadlift form and tolerance to spinal injury. Many coaches like to believe that there’s a one-size fits all approach to deadlifting form (and squatting, and benching, and every other lift). I hate to say this, but there’s not. A good coach works with his lifters to develop the ideal form that maximizes their strength potential and their ability to make consistent gains over the long-haul. Great article. I looked through the comments on the American deadlift video, they’re spewing a lot of hate there. Nice Brett, but one question. What would you recomend for people with excessive lumbar extension, aka the flexion resistant spine? Is there any particular exercises that could be used to help combat it and train neutral spine in combination with stretches like the bench t-spine stretch ala Eric Cressey? American DLs are it for me (Although I call them Deadlocks, short for deadlift lockouts and they sound cool). They strengthen my grip as I can hold much more than my max for reps and allows me lockout any weight I pull. Glad you gave credence to biomechanical differences andclimb segments, well done. Thoughts on deficit pulls in terms of risk/reward for arched lifters? Fascinating article.. love the graphs! Thanks for pointing out that the bar doesnt always have to start with the shins.. i extended it by an inch or so and found a lot better acceleration through the first half of the lift. My problem is my legs tend to straighten before i get full lockout. Is this just a technique flaw or is there something i need to strengthen to even out my pull? fantastic article. I think my problem is grip strength with my crappy lockout. I’ve figured out a way to be efficient with holding heavy weight. I need to be more active with squeezing the bar. What’s New for the Hip Thruster?